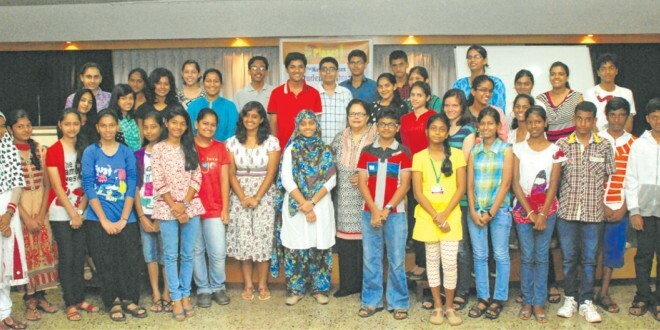 The Student Editors’ Workshop organized by The Navhind Times’ Planet J was held on Sunday, August 24 at the Dempo House, Panaji. Forty students in the age group of 14-16 participated in the half-day workshop which was conducted by Patricia Pereira Sethi. Sethi commenced the workshop by giving the participants a very simple and basic formula for writing well, Inspiration + Imagination+ Mechanics = Success. “Successful writing starts with inspiration. You must have a burning desire to write about a topic coupled with a fiery imagination if you are venturing into fiction. But these qualities must be focused, well-developed, original, organized and authentic. When you actually put pen to paper or type into your computer, mechanics will come into play. And here we mean good grammar, spelling and syntax,” she said. Sethi shared some rules of good writing as laid down by the great master Ernest Hemingway and also added some pointers to Hemingway’s genius to help the students in their writing. She encouraged the participants to write everyday and read everything they could get their hands on, even works that bore them. Her tips on self-editing were simple and very easy to follow. During the session she also shared some of her experiences with the participants thus making the workshop not just a great learning experience but also an enjoyable one. After the session, students were given a choice of topics and were asked to write about 500 words on any one. The participants utilized pointers Sethi shared with them and came up with some very creative pieces. Three of the best works were chosen and prizes were handed out by Sethi. There was also an interactive session with parents and they were briefed about what was discussed. Parents cleared some of their doubts regarding writing and editing and also suggested that more workshops on writing and editing should be conducted by Navhind Times. A big thank you for organising the editors’ workshop with Ms Sethi, It has inspired not just my daughter, Gaia, but me too. Fantastic initiative by Navhind Times. Superb space and even better facilitators ! Hope the next one to follow would be on how to publish your own book. Look forward to your next workshops. As a parent I am sure this can bring worthy benefits to the teenagers who participated in this workshop. Thanks for organizing the same. Thanks a lot for this lovely morning. I enjoyed it thoroughly. There is nothing that would make this workshop better as it was well organized. I really enjoyed the workshop. It was nice to interact with someone who has experienced a completely different world. The tips on writing were ‘quite’ useful and ‘got’ me thinking about the words we use and those we can use. I learnt many things about writing and will use it to improve my writing. The workshop has given me direction on how to write and edit. When I write, I usually get stuck but after this workshop I don’t think I will any more. I will definitely use the guidelines given by Ms Sethi to improve my writing skills. Thanks Planet J and Ms Sethi for this wonderful learning opportunity. I am now eager to try out all the tips given by Ms Sethi and hopefully write a few articles. It was a wonderful learning experience for me. Amazing use of a Sunday morning! I usually NEVER EVER wake up this early on Sundays but totally worth it. The workshop was exceptional! I learnt a lot and enjoyed myself immensely. I have gained a lot from this workshop. Thank you. I travelled a long way from Valpoi for this workshop and it was worth the effort. Thank you once again. The workshop has inspired me. A big thank you for the super workshop. I usually have many ideas but cannot express them. After this workshop I feel I will be able to do so. Ms Sethi is an incredible mentor and the workshop was amazing. I will definitely use the tips in future. The Student Editor’s Workshop conducted at Dempo House was an enriching experience. The Workshop helped me to understand the basic styles of essay writing and short stories. I’m sure this will help me in creating my own unique style of English writing. My Sunday was well spent attending the Student Editor’s Workshop at Dempo House and helped enhance my creative writing skills. The expertise of Patricia Pereira Sethi was well received and the tips she offered will go a long way in helping me to take up the art of English writing.